-- Select a Size/Color -- Medium - 8.5" Large - 11.5" - Out of Stock! Inspired by the pulse of New York City street culture and art, our Grriggles® Funky Fellas Dog Toy in Blue is one-part cool and three-parts F-U-N-K-Y! Our Grriggles® Funky Fellas squeaker toys are made from a range of naturally soft and squeezable textures. Dogs will enjoy the contrasting textures! 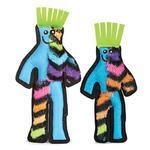 This groovy neon dog toy with a squeaker is great for tossing and tugging. Choose the Medium or Large size to suit your pet's needs. Mixed materials of tennis-ball fleece, silky-soft plush, and rugged nylon-webbing for far-out textures and mouth feel. 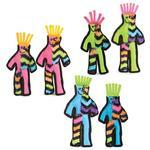 Collect all of the colors of the Grriggles Funky Fellas Dog Toys! Each sold separately. Easy to follow website. Best prices online by far! !